The American Academy of Dermatology advises that laser treatment to remove hair should only be performed by medical doctors who are knowledgeable, skilled, experienced and have in-depth knowledge of the skin and lasers. The dermatologists at Mayoral Dermatology are all highly skilled and experienced in performing laser hair removal. Please contact us to find out the best hair removal option for you. Laser hair removal is a medical procedure in which hair is removed by an intense, pulsating, beam of light. It is used on the back, the bikini area, chest, face (especially the upper lip and chin), neck and shoulders. It can’t be used on the eyelids or surrounding area. Usually, several visits are necessary to get the desired result, about 2 to 6 treatments. Most patients are free of the unwanted hair for several months. When the hair regrows, most patients see noticeably less hair than before treatment. The hair tends to be finer and lighter. Laser hair removal, however, is not considered permanent. Hair color and skin type influence the effect and success of laser hair removal; it is most effective for people who have light skin and dark hair, because the laser beam targets the melanin (pigment) in the hair, but there have been new developments in laser instruments which have made laser hair removal an option for more people who have dark skin. The method is not effective for white, gray, red, or blond hair, because they don’t attract the laser energy, but new methods are being developed to make laser hair removal an option for people with lighter hair. The area to be treated is cleansed, and sometimes an anesthetic gel will be applied to skin for numbing the area to be treated. Numbing may help if a small area is to be treated, or if the area has very sensitive skin. Usually, treatment takes place in a room set up especially for laser treatment. Everyone in the room must wear eye protection during the procedure. The physician performing the procedure will press a hand-held laser instrument to the skin. Depending on the type of laser, there may be a cooling device at the tip of the instrument, or a cool gel may be applied to protect the skin. The skin is held taut while treatment is taking place. When the laser is activated, the light passes through the skin to the hair follicles, bulbous structures from which the hair grows. The heat energy from the laser damages the follicles, which inhibits hair growth. Many patients say that the laser feels like warm pinpricks, or liken the feeling to being snapped with a rubber band. The hair is vaporized, creating small plumes of smoke with a sulfur-type smell. The duration of the treatment session varies with the size of the area to be treated. Treating the upper lip may take just a few minutes, but if a large area like the back, or the legs, are treated, the session can last an hour or more. Usually there is no recovery time needed. Most patients resume their usual activity immediately. There will be some redness and swelling after treatment, resembling a mild sunburn. Applying a cool compress can relieve some of the discomfort. There may also be some pigment changes – lightening or darkening of the affected skin, usually temporary. Skin lightening primarily affects people who have dark skin. Rarely, laser hair removal can cause blistering, crusting, scarring, or other changes in skin texture. Also uncommon, problems can occur with graying of treated hair, or excessive hair growth may occur, in or around treated areas. WARNING: The American Academy of Dermatology strongly cautions that laser hair removal can be dangerous when performed by inexperienced operators. Burns, permanent changes to skin color, and scarring can occur. You greatly reduce the risk of side effects by having your treatment performed by a medical doctor who is very knowledgeable about laser treatment and very experienced in its administration. Medical doctors also know the properties of skin. The amount of time until it is safe to have the next laser treatment in a series varies from patient to patient. For most patients it’s six to eight weeks. 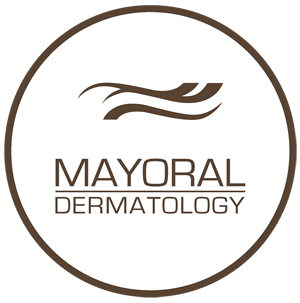 Your Mayoral Dermatology physician will manage your laser treatment schedule to ensure safety. How any laser treatments will I need? Am I at high risk for side effects? Your cosmetic dermatologist will tell you if she thinks a different treatment would be better for you. Have taken or are taking any medications, prescription or nonprescription. After laser hair removal, avoid sun exposure, both outdoors and in tanning beds. When your skin has healed, use sunscreen. Many women moisturize their face daily with products containing a sunscreen. You may experience hair shedding in the first few day and weeks after treatment. It can sometimes be mistaken for hair growth. Laser treatment has become so popular that lasers intended for use at home are being sold. There aren’t any solid research studies comparing the safety and effectiveness of home devices to laser hair removal done at a doctor’s office. The United States Food and Drug Administration treats home laser devices as cosmetic devices, not medical devices, therefore the home lasers do not get the scrutiny of medical devices. The American Academy of Dermatology does not endorse nor encourage use of laser hair removal devices intended for home use. 2. Laser hair removal. American Academy of Dermatology. https://www.aad.org/media-resource/stats-and-facts/cosmetic-treatments/laser-hair-removal.